For some reason I am full of a tetchy belligerence today, tired, scratchy listless and irreverent, so pretty much like most days for me. Although for the majority of this trip I’ve had saucy a twinkle in my eye and what has seemed like an undentable feeling of positivity and determined glee. I have felt funny a lot of the time, a feeling that brings with it a great sense of self worth for me. For now though I feel rather adolescent – as I write this sitting in cabin 308 I am listening to ‘Back In Black’ by AC/DC and the door has just been politely closed by the residents of 310 across the hall. Huh! Grown ups don’t like my music. Good. In a minute I might stand at the top of the stairs and shout ‘none of you understand me anyway… can’t you see I’m an adult?’ then scratch something rebellious and petulant in the table top with a compass just to see what would happen. I probably won’t. For several reasons, 2 of which are my children who I am missing terribly, another is my wife who I can’t wait to see and would hate to disappoint. Another still (and more immediate) is because explaining to 43 people why I’ve decided to put eye-liner on and behave like a spoilt trustafarian pleb would be testing and awkward. 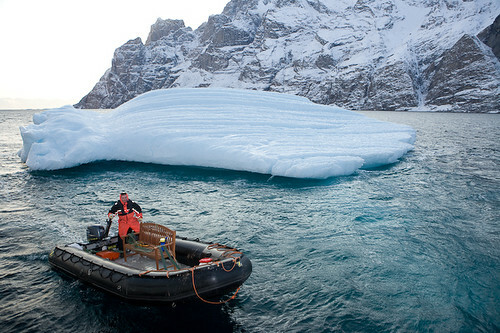 The Greenlanders have reclaimed their place names, so the glacier shown on Danish maps as the Jakobshavn Glacier is now the Ilulissat Glacier. It is moving at 38 metres per day now sliding on more melt water and producing more icebergs than any other in the world. 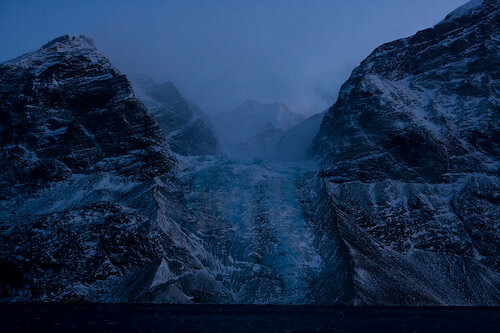 It would be amazing to be near enough the glacier front to hear the sound made by the calving of the icebergs. But the spot where we land by zodiacs is at the edge of a gigantic iceberg pile up caused by the terminal moraine, like a dam across the sea mouth, 50 km away now from the glacier front. 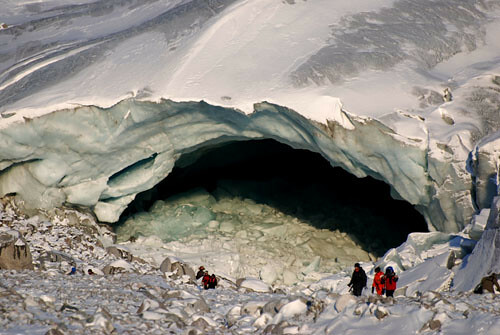 The scientists have been giving us occasional classes in geology, explaining the action of glaciers, or how the salinity and temperature of the ocean contain clues to climatic behaviour. For almost everyone on board time is a very precious resource – to take ten days out to make this expedition is a big investment. But the sense I get is that we’re all pathetically grateful to have had the chance to come to this place, and to do it in this eclectic gaggle with enough time to absorb the place, to learn something and to cross-pollinate. 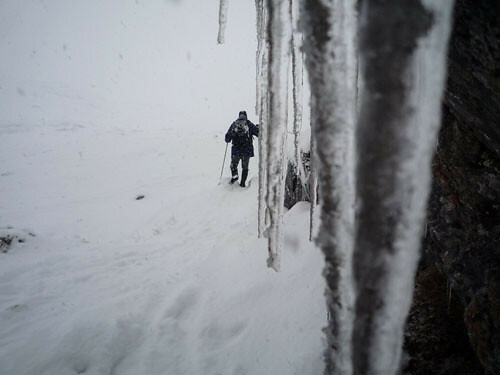 To be in the Arctic is inspiring but the responses and needs vary widely. Some want to engage in some slow careful thinking about new work (ceramics, opera, theatre, writing), others want to work out how they can do their environmental housekeeping and understand the issues well enough to help engage their huge audiences in the topic (musicians). Read on and more of Joe’s posts, and his colleagues’ responses, on the Science, Technology and Nature Blog. 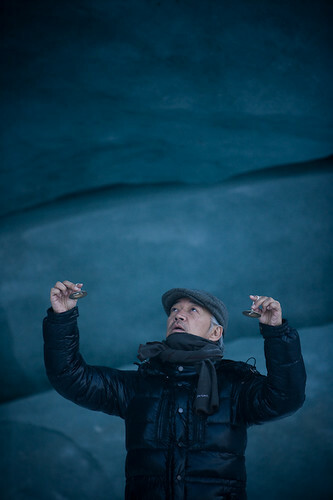 Ryuichi Sakamoto recording sound at the mouth of Sermeg Avangnardleq Glacier. 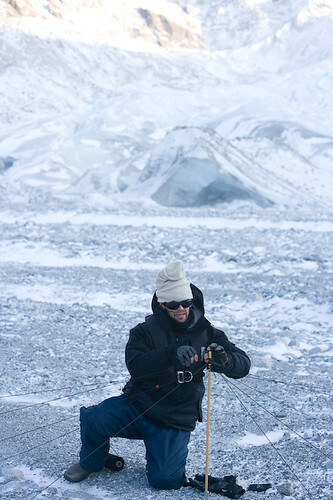 Julian Stair walking through snow and ice at Sermeq Avangnardleq Glacier. Today I went ashore and we performed a play I wrote three days ago. It’s called UUMMANASUAQ/BIG HEART SHAPE/CAPE FAREWELL. It’s a forever play, meaning while we only see a few minutes of it, it takes forever to perform. Lemn and David N were in it. They were awesome and very brave working in the cold. 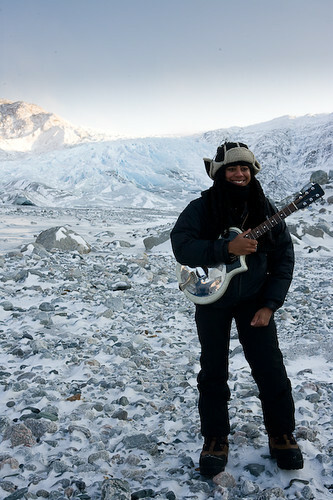 Then Peter wanted me to play some slide blues guitar while hanging out on the glacier so on I played Robert Johnson’s “If I had Possession Over Judgement Day.” Magical. My best performance ever, I think. It means a lot to me to bring the blues this far north. Sorry I haven’t been blogging for a couple of days, but events and activities got the better of me! I was convinced we were on Wednesday today and was shocked that it is actually Friday! Somehow the Arctic induces a complete loss of any realisation of time, date and day. On Tuesday evening (30th September) we ran a profile past the mouth of the Torssukatak fjord, into which two large glaciers feed, and up into the Suvdlorssuaq passage which runs between Disko Island and the Nugssuaq Peninsula. We have clearly imaged what I think are the lateral moraines for an old ice stream, standing proud of the seabed. There are also multiple channel incisions with sediment infilling.